Working with artist, photographer, and director Bruno Aveillan since early last year, Swarovski have created a unique cinematic piece to celebrate the fashion and jewellery brand’s 115 year heritage. 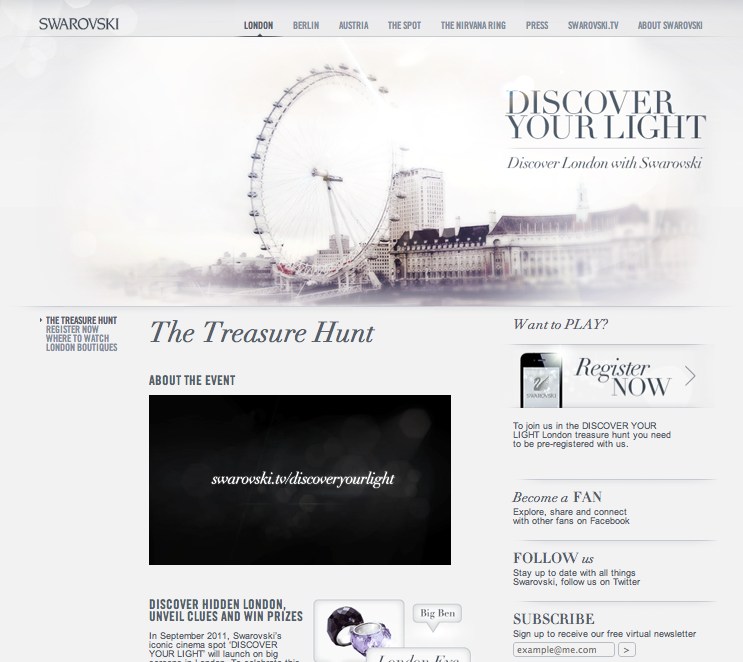 This film will also mark the launch of the exciting new Swarovski ‘Discover Your Light’ Treasure Hunt, taking place in London on Saturday 24 September – for which Swarovski have collaborated with an interactive US games specialist to create the Treasure Hunt where players are guided by their Smart Phones using their unique app. Channel 4 BRITDOC Foundation and PUMA.Creative announced 10 award winners of grants of up to €5,000 for the Winter 2010 PUMA.Creative Catalyst Awards. The PUMA.Creative Catalyst Awards are a rapid response fund to support the very best in creative documentary filmmaking. Providing strategic and catalytic resources in the early stages of documentary projects, to shoot and edit a film trailer that can function as a tool to demonstrate and accelerate the potential of the filmmakers’ vision. Each quarter, ten new film development awards will be granted. For Winter 2010 over three hundred and fifty submissions were received from filmmakers working as far afield as China and Peru, Poland and South Africa. Film submissions included such important stories of our times from ending gang violence in inner cities to outlandish environmental protesters in the Andes, from emancipation on the race track to celebrating Africa’s finest Laureates.